This was last weekend, 5/16/15. People came out in droves to celebrate Buddha’s birthday. I am admiring the culture, NOT the religion. I can’t wait to shoot more of the city skyline. It’s magical! The other day I went for a stroll around my neighborhood with a fellow photographer looking for anything that might be of interest within the viewfinder of my Nikon. I love taking pictures in the twilight hours! 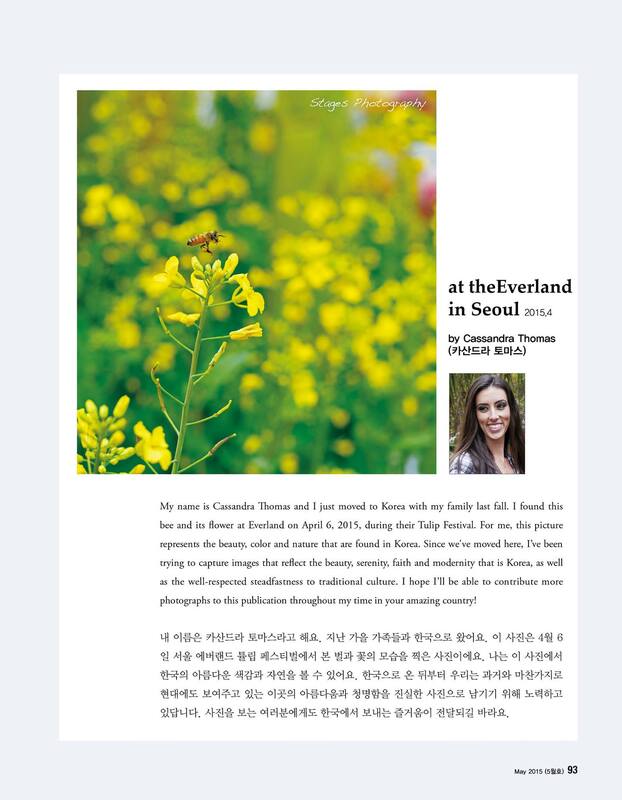 I’ve Been Published in a Korean Magazine! A Korean magazine asked if they could use one of my images in their latest publication. I’m so very honored! As a bonus, now I know how to write my name in Korean! The family and I went to Everland ‪for the first time this week. Everland is a bit like 6 Flags back in the states, complete with a water-park and a zoo! It just happens to be their tulip ‪festival right now, so if for nothing else, you must go just to see the beautiful blooms! There is also a really neat “safari” ride, where you take a bus (ride in a SUV for an extra charge and spend more up close time than you ever thought possible) through the animal’s exhibit. It’s a quick ride, but I tell you, it’s a pretty amazing and thrilling experience! I’ve never been so close! Something else the whole family enjoyed was the aviary where, for a dollar, you can feed the birds right out of your hand! There’s a wide range a food available, including nostalgic American food, burgers and a KFC! Everland is in Yongin ‪and is only about an hour away from Camp Humphreys. Did a little temple admiring in Yeoju last weekend! The Buddhist temple, Silleuksa, overlooks the Han River which runs from Mt. Bongmi to the Yeo River. According to Visit Korea, Silleuksa was probably built by Monk Wonhyo during the reign of King Jinpyeong in the Silla Period. Last weekend I went to Jindo ‬ for the Sea Parting Festival ‪‎‬ with my family and friends. What an amazing experience! We arrived in the wee hours of the morning, and were promptly fitted for our knee-high rubber boots. After receiving our torches we headed out to the sea! People clamored to the sand bar, trying to make it all the way to the island. During this night-time excursion we were pleasantly surprised by fireworks! The sun rose rather quickly, as did the tide. As the tide rose, people were forced off the sand bar and onto the beach. Only a few lingered as long as they could, digging for precious (and apparently delicious) clams.